With the Mr. and Mrs. 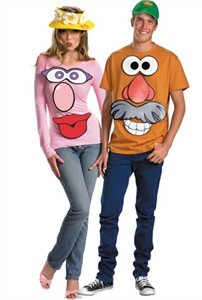 Potato Head Costume Kit you'll have the most hilarious couples costume around! Grab your sweetheart and be the bickering couple from the beloved Pixar movies in these Toy Story Costumes. The kit includes 2 character hats and 2 sets of T-shirt stickers. Availability: This Mr. and Mrs. Potato Head Costume Kit takes approximately 1 business day to leave the warehouse.